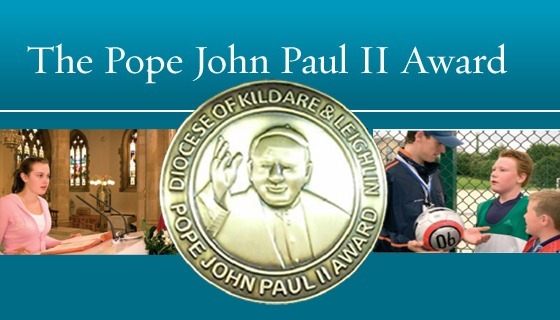 The second award ceremony for the Pope John Paul II Awards will take place on Friday 2nd March in the Seven Oaks Hotel Carlow. One hundred and sixteen young people from 29 parishes & 20 schools/colleges across the diocese have successfully completed the award this year. The students will be receiving Papal Cross, Gold, Silver or Bronze medals and certificates depending on which level of the award they choose to complete. The young people who participated in the award this year were involved in a range of voluntary activities in their local parish and community. Some students visited residents in local nursing homes, some fundraised for various charities, several of them attended World Youth Day in Madrid last summer and many also got involved in the local choir or in ministries in the Church. All one hundred and sixteen of them have used their gifts and talents to contribute in a positive way to the life of their parish and local society. Mary Kennedy from RTE will be present on the night to congratulate the young people on their achievements. The awards will be presented by Mary and Mgr. Brendan Byrne, Diocesan Administrator. In attendance at the award ceremony will be family and friends of the awardees and representatives from their schools and parishes. There will be entertainment on the evening and refreshments will be served after the ceremony. The Award Ceremony will be a night to celebrate and acknowledge the great work the young people are doing and thank those who have supported them. During the evening some of the young people will be sharing their experiences of completing this award. This Award was created to commemorate the late Pope John Paul II who was so committed to young people and who had such belief and confidence in them. It was launched by the Papal Nuncio to Ireland His Excellency Most Rev Dr Giuseppe Lazzarotto on 7th November 2006 in the Diocese of Derry, Ireland. It has also been taken up in the Diocese of Dromore. The Award is aimed at young people between the ages of 16 and . Through the Pope John Paul II Award, young people in the Diocese of Kildare & Leighlin will be enabled to take an active part in the life of their Church, in the life of their community and society, and also become more aware of the teaching and role of the Catholic Church in the world. This will enable young people to engage at a deep level with Christ, whose body the Church is. It will allow young people to understand that religion and faith are not just for learning, nor are they a list of rules, but that they are for living. It encourages and fosters involvement in Parish Life and Social Awareness among young people in this age group, and acknowledges this with the presentation of the award when the criteria are met.